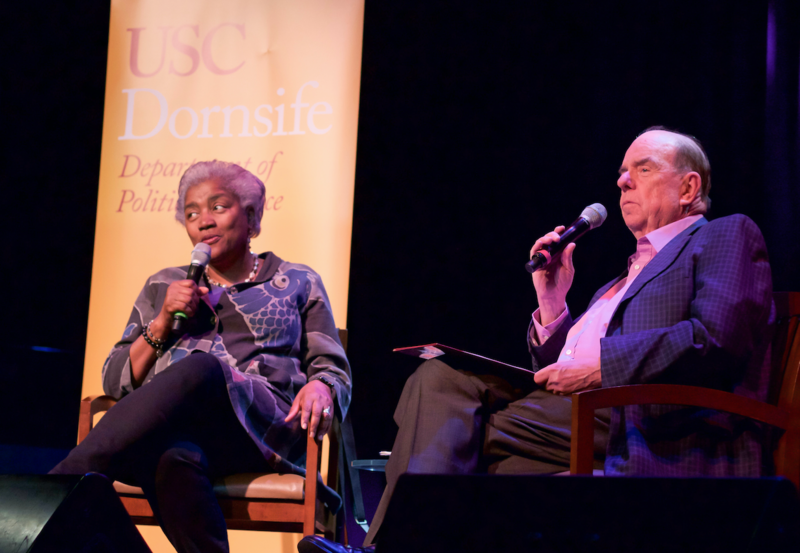 Students met at Tommy’s Place on Tuesday to hear Democratic strategist Donna Brazile talk about past elections with USC Unruh Institute of Politics director Bob Shrum in the Institute’s final installment of its semester-long Political Conversation series. The series has hosted a diverse group of guest speakers this semester, including well-known Republican pollster Frank Lutz and former White House Communications Director Anthony Scaramucci. Brazile, now an adjunct professor in the women and gender studies department at Georgetown University, has led a well-rounded political career. She is the first black woman to manage a presidential campaign, acting as the campaign manager to former Vice President Al Gore’s 2000 campaign. Brazile and Shrum discussed the 2000 presidential election, which is remembered largely for leading to a recount of votes that resulted in George W. Bush winning the presidency. Brazile believed Gore won the election but there were mal-voting processes in Florida where the votes were contested. “I’ve worked very hard over the last 18 years to improve access to the ballot box,” Brazile said at the event. Additionally, Brazile is the only person to serve as the Chair of the Democratic National Committee twice. Her first time was during the 2012 election and her second time came in the 2016 election after Debbie Wasserman Schultz resigned from the position following a leak of emails from the DNC that indicated a bias toward former Secretary of State Hillary Clinton’s presidential campaign. After serving for a second term, Brazile said she conducted an investigation and found that the Clinton campaign had already assumed control of three DNC departments before securing the Democratic nomination. At the event, Brazile discussed her new book, Hacks: The Inside Story of the Break-ins and Breakdowns That Put Donald Trump in the White House, and the backlash she received from President Donald Trump supporters, Senator Bernie Sanders and Clinton. Brazile said she believes multiple factors lead to Clinton’s defeat. Brazile said Congress needs to take more aggressive steps to “protect the vote” and discourage Russian interference in future elections. Cybersecurity is the nation’s greatest security threat from countries that are attempting to destabilize Western democracies, Brazile said. Shrum posed the question of whether Trump has changed the nature of American presidencies moving forward, saying that former presidents John F. Kennedy and Ronald Reagan were able to appeal to the majority of Americans while “lifting them up.” But Brazile says Trump’s behavior runs contrary to this ideal, which will have a lasting impact. Brazile said the Democratic Party needs “new blood” and a positive message that will appeal to voters in the 2018 midterm elections and the 2020 presidential election.